Built around BMW’s new car-based Cluster Architecture platform, the flagship X7 was first unveiled in October last year. It went on sale recently and was also recalled for the first time in the US over loose seat belts. The car is expected to be a direct competitor to the Mercedes-Benz GLS Class and the Cadillac Escalade. BMW has given it the latest in chassis and powertrain technologies, which are complemented by an elegant exterior that brings forth the car’s commanding presence. The interior design is focused more on the delivery of unparalleled driving experience with special emphasis on the riders’ comfort. The X7 is the largest of BMW’s SUV models and it is built at BMW’s South Carolina Plant in the US. In UAE, this proper-seven seater is available in six colour options as Mineral White, Alpine White, Black Sapphire, Sunstone Metallic, Arctic Grey and Vermont Bronze. Buyers can choose between two engine options, i.e petrol and diesel. In the petrol-powered X7 xDrive 40i, one can see an inline-six 3.0-litre engine that can churn out a maximum power of 338 PS and a peak torque of 447 Nm. On the other hand, the diesel-powered X7 M50d comes with a six-cylinder 3.0-litre engine, which gives 400 PS of maximum power and 760 Nm of torque. The largest model in the BMW X line-up carries an expected price tag of AED 343,700 in UAE for the xDrive 40i variant. Have a question on X7? X7 is available in 6 different colors - Sunset Metallic, Black Sapphire, Alpine Whte, Mineral White, Bronze and Arctic Grey. Feeling the heat of the big flagship SUVs from the rivals, BMW came up with its biggest SUV yet, the X7, not so long ago. The X7 previews what BMW has got the best in terms of SUV engineering, with it showcasing some of the very best traits unseen on a BMW SUV. In UAE, the BMW X7 is available in six color options to choose from – Alpine White, Black Sapphire, Mineral White, Sunstone Metallic, Vermont Bronze and Arctic Grey. On the inside, the new BMW X7 follows the recent trend of the new range of BMW SUVs with an enhanced version of BMW’s cockpit design. Gone is the boring looking instrument console, which makes way for a rather flashy looking full LCD console, which has a very futuristic appeal with the incorporation of a navigation system as well as BMW’s iDrive screen. The steering wheel also is an all-new unit and feels good to hold and see, courtesy the very nicely executed silver finish on the spokes. The center console has been redesigned, and while it still is tilted more towards the driver side, the layouts of the central AC vents as well as minimalist buttons for automatic climate control look very premium. Even the design for the infotainment screen looks nicer with a wider display on offer. Dripped in high-quality leather and wood trim options, the interior cabin of the BMW X7 feels a luxurious place to be in, in the highest regard. There are a total of nine upholstery options and seven trim levels to choose from. While the X7 has seven seats on offer, the third row is still best suited for people with shorter heights, thanks to the limited legroom. 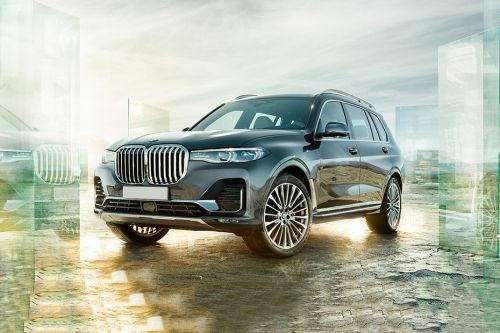 Like every other BMW SUV, the X7 too has a commanding road presence, and given that it is the biggest BMW SUV yet, the progress is worth praising for. The X7 is the longest and widest BMW SUV till date, which gives it a tremendous road presence. The X7 was the first BMW vehicle to be blessed with the new BMW large-themed dual kidney grille, which might look a bit quirky when viewed head-on. However, this large grille gets complemented with rather sleek looking full LED headlamps, which do give the X7 an intimidating front fascia. From the sides, the long wheelbase makes the X7 look elegant, the effect of which only increases with the subtle use of chrome garnish on the window frame and lower portion of the side doors. While the side body cladding does give the X7 a much needed rugged stance, both the choices of alloy wheel designs give it a sporty effect. At the rear, the X7 sources a lot of inspiration from the 7-Series sedan, with the sleek LED tail lamps joined by a thick strip of chrome, which does make the rear end look very premium and typically BMW-ish. For the X7, BMW has fine-tuned its EfficientDynamics technology to ensure that the SUV offers a planted driving experience with the BMW’s tried and tested driving dynamics, despite the X7’s sheer weight and size. With a full time four wheel drive on offer, the X7 comes with multiple drive modes and suspension and comfort modes which can be altered to one’s preferred driving settings. BMW has made the X7 available in two engine options – one each of petrol and diesel fuel choices. The petrol powered X7 xDrive 40i comes with a 3.0-litre inline six petrol engine, which develops 338PS of maximum power and 447 Nm of peak torque output. The diesel-powered X7 M50d, on the other hand, is blessed with a 3.0-litre six-cylinder diesel engine, which produces 400 PS of power and 760 Nm of torque. Both these engines are mated to a common new generation 8-speed automatic gearbox. On the safety front, the BMW X7 packs in all the top-notch safety features which need to be there on a flagship SUV. The safety features include front, side, curtain, and knee airbags, ABS with EBD and Brake Assist, Lane Departure Warning, Forward Collision Warning, cornering brake control, dynamic traction control and hill start assist and many other high-tech active features. The new X7 is the most advanced SUV from the German automaker to come out in recent time, the premium effect of which only increases by its sheer size and new generation interiors. At the same time, the core BMW values of uncompromised performance levels and driving dynamics make the X7 a very much likable SUV. What is the price of BMW X7? On road prices of BMW X7 xDrive 40i in is costs at AED343,700 . What are the colors options available in BMW X7?